The normal axillary temperature may be as much as 1ºC lower than the oral temperature (OER #1). An axillary thermometer is the same electronic device as an oral thermometer, and both have a blue end. Remove the probe from the device and place a probe cover (from the box) on the thermometer without touching the cover with your hands. Ask the client to raise the arm away from his/her body. Place the thermometer in the client’s armpit (OER #1), on bare skin, as high up into the axilla as possible, with the point facing behind the client. Ask the client to lower his/her arm and leave the device in place for as long as is indicated by the device manufacturer (OER #1). Usually the device beeps in 10–20 seconds. Discard the probe cover in the garbage (without touching the cover) and place the probe back into the device. 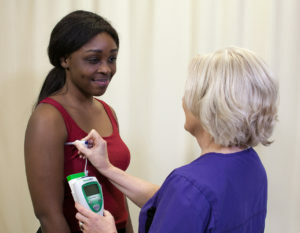 See Figure 2.6 of an axillary temperature being taken. The axillary route is a minimally invasive way to measure temperature. It is commonly used in children. It is important to ensure that the thermometer is as high up in the axilla as possible with full skin contact and that the client’s arm is then lowered down. Axillary Temperature by Ryerson University is licensed under a Creative Commons Attribution 4.0 International License, except where otherwise noted.